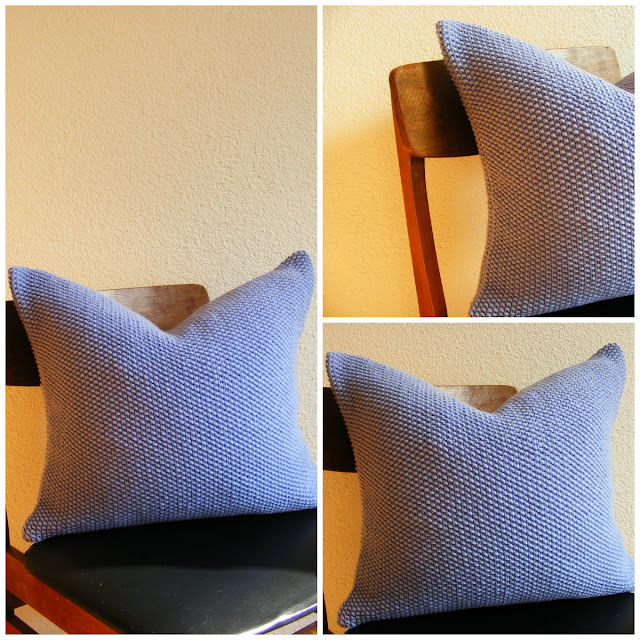 I've been lucky in that Strikk Hand Knit Moss Stitch cushions have proven to be quite a hit - I keep meaning to make one for myself, but somehow that never happens. I have also been looking for colour inspirations - some interior ideas and how to mix up the yarns and colours, and came across this lovely home (excuse the page photograph). I loved the use of both a very neutral colour, but then different fabrics (the leather cushion looks fabulous) as well as the photograph cushion, all neatly pulled together with the gorgeous knits. So, having rummaged through my yarn, I found some lovely lavendar and got inspired to knit a rather large (50x50cm this time) moss stitch cushion which would fit absolutely perfectly in such a home. You find the lavender cushion here .